What can I say about Cassandra Clare that hasn't been already said? What more to say that will do justice to her and her work? I think that everything has already been said. Cause Clare and her books are really totally worth of all the attention they are getting! Clockwork Prince is AMAZING! I mean Clockwork Angel was really good, a book I trully enjoyed reading, but Prince is even better. The way the characters evolve in this book, the way their feelings and thoughts are unfolded before the readers' eyes is done in such a way that leaves your heart broken. Tessa, Will and Jem just left me in total awe in this book. Or rather Clare left me awed with the way she handled her characters and the relationship between them. In Clockwork Prince we are not dealing with a usual love triangle. In no way. The love triangle here isn't just a trend as it is in most books I've read so far. The love triangle is essential and so well formed and delivered that just leaves your heart broken. By the end of the book I was sad about all three of them. Clare just focused on the emotions of her characters and that worked in advantage to the story. Believe me, there's been a few days since I finished reading this book and I'm still stunned over how amazing it is. I won't actually say anything about the story itself of this book. No need to spoil things for you. If you have read even a single book by Cassandra Clare you already know how good a writer she is and how addictive her stories are, so you know what to expect already. Every element that makes all her other books so successful is present in Clockwork Prince. So, just pick this book and everything else that Clare has written and enjoy the ride! I liked Clockwork Angel so I'm glad to hear this one was even better! Nice review! EEEP! Loved your review! I can't wait to read it! I think this is a little bit too scary for my tastes. "to a manor house that holds untold horrors, from the slums of London to an enchanted ballroom where Tessa discovers that the truth of her parentage is more sinister than she had imagined". Words like horrors and sinister are sure to put me of. This book was so amazing! Cassandra jumped you right into the plot and started all the twist right away. The love triangle between Tessa, Will, and Jem is one of the best I have ever had the pleasure of reading. You will laugh, you will cry (a lot!)... 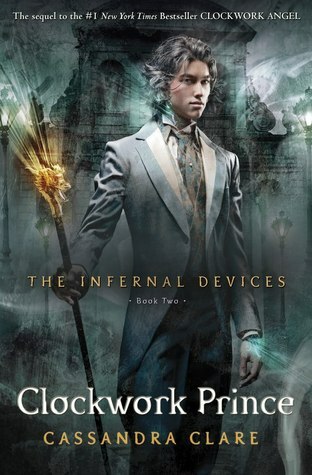 Oh I cannot wait for the Clockwork Princess (September 2013 is just way too far away, but be on the lookout for her next book in the Mortal Instrument series City of Lost Souls). Read this and you will not be disappointed! This book is incredible. It's beautiful. It's exciting. It's romantic. And it's my argument against everyone who says that contemporary YA fantasy can't be literary. All the summaries and images of book covers i use in this blog are from Goodreads.com,unless i note something comes from a different source. Likewise remember which you spend time there before determining and should drop by the school.